His Holiness Gyalwang Karmapa arrived at Tergar Monastery at dusk. Many devotees, local Tibetans and six hundred monks have been waiting for hours eagerly to have a glimpse and blessing of His Holiness. He arrived from Delhi via Patna to Bodhgaya. This is the beginning of his annual winter tour. The monks holding Serbangs were led by Yongey Mingyur Rinpoche and all the head Khenpos of different monasteries who are attending the annual Karmae Gunchoe Winter Debate. Video footage and other information are available at the Monlam blog. His Holiness will visit the Mahabodhi Stupa in the morning. This will be his first visit to the Stupa for this tour. At Tergar in December, His Holiness is formally presiding over the 12th Karmae Gunchoe, the Kagyu Annual Winter Program of Philosophy and Debate (Karma Gön Chö). The Karmae Gunchoe involves extensive debate and philosophical inquiry into the teachings of the Lord Buddha and Kagyu Lineage, and is participated in by khenpos (professors) and monastic students from the different shedras (monastic colleges) of the lineage from all over the region. The program begins with an address by His Holiness on the importance and relevance of the annual Gunchoe meeting of Karma Kagyu Monastic Colleges. His Holiness will conclude the instruction on the Gunchoe program. 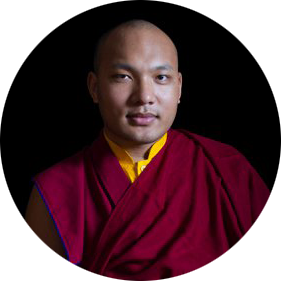 His Holiness will give teachings to the 12th Karmae Gunchoe participants on Madhyamaka based on the Ninth Karmapa Wangchuk Dorje’s text elucidating on the landmark Prasangika Madhyamaka text by His Holiness the Eighth Karmapa, Mikyo Dorje.